Many homeowners want hardwood flooring in their basement but are concerned about the potential of flooding and water damage. DBS has the perfect solution for this problem with ThermalDry® Elite Plank Flooring, a faux wood flooring that looks and feels like natural wood. If you're interested in wood flooring for your basement, call us today at 1-855-259-9625 or click below to learn more about how we can help you. We offer free estimates on all of our work in Superior, Duluth, Minneapolis and the nearby areas. If you're ready to get a wood basement floor that solves your waterproofing needs, call the experts at DBS today. Our patented basement flooring solutions will ensure that you have a clean, dry basement that looks fantastic. Call us today at 1-855-259-9625 or contact us online to get started on your basement flooring project with a free estimate. 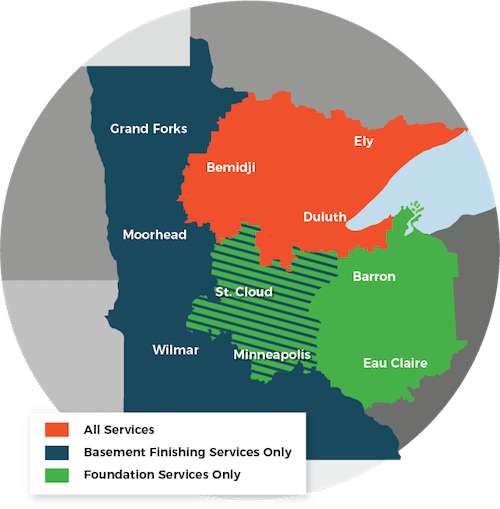 We offer all our waterproofing services in Superior, Duluth, Minneapolis, Two Harbors, Cloquet, St. Paul, Hermantown, Virginia, Ashland, Esko and the nearby areas.